A walk in the park isn't the only way to get your furry bestie moving. Here are some easy, fun ideas for cats and dogs. Owning a pet has benefits as wide-ranging as reducing stress, improving mood, strengthening the heart and lowering blood pressure. And while a daily dog walk or cat toys are an important part of keeping your buddy fit, nothing beats interactive play for combining bonding with exercise. Here are some activities you can try with your furry bestie to help keep them fit, healthy and loving life. This one’s great if you’re not feeling overly energetic, as all you need is some bubble mix and your lungs. While you can buy pet-friendly formulations there’s no need; bubbles made for kids are perfect as they’re non-toxic. 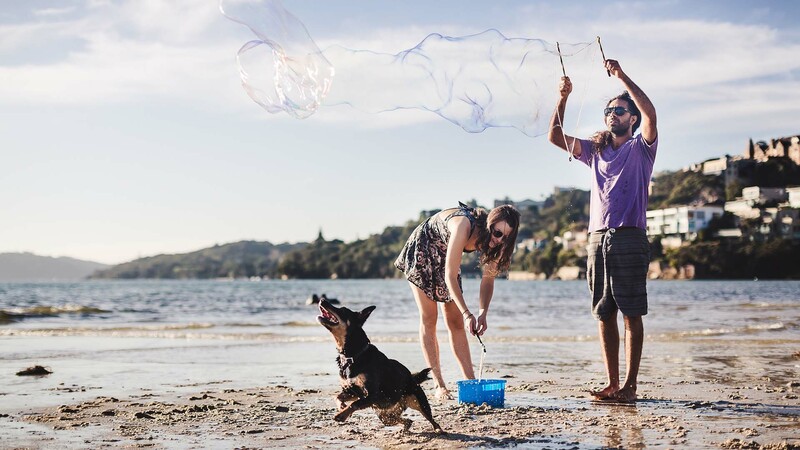 Just dip, blow, and watch your dog go wild popping bubbles around the backyard, or even the lounge room. Flyball is a competitive relay sport where teams of four dogs jump over a line of hurdles, catch a flying ball they trigger with their paw, and return over the hurdles to the starting line. As the handler, you’ll be right there in the action, encouraging your dog on and calling them back, so it’s a wonderful way to work on obedience and deepen your bond, plus you’ll benefit from the social connection of the human flyball community. A fancy name for ‘hide and seek’, nose work is a great way to engage your dog’s senses and keep their mind busy. It can be done anywhere, and is ideal for less mobile dogs and owners. Start with a toy or treat your dog loves, and place it at the other end of the room while they’re watching, then release them with a command such as “find it”. Once your dog has that down, gradually up the difficulty by hiding the treat out of sight. Eventually you can hide treats all around the house or outdoors. With a simple pen laser or levelling tool you can send your cat diving around the room from the comfort of your couch. Just make sure to follow up with a toy your cat can actually catch to prevent frustration, and never point the laser directly into their eyes. These plastic fishing rods feature a bunch of feathers attached to a string at one end, and drive most cats wild. You can make this a workout for yourself by running around the house, trailing the toy behind you, and flipping it up over couches and chairs. All you need to build your cat their own hockey rink is a ball or scrunched up paper dropped into a large cardboard box or bathtub. Bouncing the ball against the sides of the box or bath will have your cat flipping around like crazy, getting plenty of exercise. And there’s no need to buy special cat toys; a ping pong ball is the perfect weight for high energy play.